Clayton Maurice Zent 85, of Prospect, died Tuesday February 6, 2018 at the Mansfield Hospital. He was born June 1, 1932 in Marysville to the late Guy Maurice and Hazel Elizabeth (Augenstein) Zent. He was also preceded in death by his wife Eloise Mildred (Hayes) Zent whom he married on June 12, 1953 and she died September 29, 2009. Also preceding him in death were a son, Ron Zent, twin infant daughters, Collette Elizabeth and Paulette Eloise and a sister, Shirley Marks. 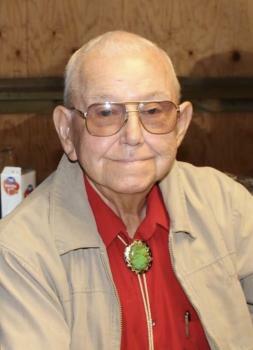 A 1950 graduate of the Magnetic Springs High School and a veteran of the United States Air Force during the Korean Conflict, Clayton lived in Prospect since 1962. He had attended Pharisburg United Methodist Church in his younger years. He was the owner of AST Machine in Prospect, designing and building automation test equipment for Whirlpool Corporation, among other projects, until his retirement in 1998. Clayton was a lifetime member of Verne I. Mounts American Legion Post 368 in Prospect, a lifetime member of the A. T. A., also a lifetime member of the National Rifle Association, and a founding member of the Richwood Gun Club. He was an avid shooter, instructor and collector. He is survived by a son, LeRoy (Jackie) Zent, Galion; two daughters, Sheila (Jerry) Martin, Marion; Sandra (Tracy) Mills, North Canton; three grandchildren, Michael Zent, Sarah (Eric) Conley and Stephanie Zent; eight great-grandchildren, Destiny, Arianna, Joey, Madison, Draven, Sean, Hunter and Carlee; and a sister, Mary Jo Fox, Marion. Funeral services will be Saturday, February 10, 2018 at 11:00 AM at the Stofcheck-Ballinger Funeral Home, Prospect with Pastor Scott Buell officiating and military honors being conducted by the Marion County United Veterans Council. Burial will follow in Prospect Cemetery. Friends may call on Friday, February 9, 2018 from 4 to 7 PM at the funeral home in Prospect. Memorial gifts may be made to Richwood Gun and Game Club, P. O. Box 112, Richwood, OH 43344 and the Verne I. Mounts American Legion Post 368, 308 Main St. Prospect, Ohio 43342. I'm so sorry for your loss! Love you all and praying! My heart is heavy with grief of the loss of Uncle Clay,I knew him to be a good man with a cigar! I will keep you all in my prayers, May God be with you all at this time. So sorry to hear about Clayton's passing. I worked with Clayton on a few projects over the years at Whirlpool. He was a good man who will be missed. Clayton was the most unique person I ever had the privilege to know. He was also one of the smartest people I ever worked with. I was a Test Engineer at Whirlpool for 33 years. I met him on advise of the engineer I replaced at work and worked with him on numerous projects from 1984 until he retired in 1998. I continued working with Leroy, who had a great teacher, until I retired last year. He was the best! I miss his smile, wit , and most of all, his robust belly laughs! God has received one heck of a designer who can come up with any fix for problems behind those pearly gates! Prayers and condolences to Leroy, Sandra and other family members. He was one of a kind and will always be thought of with fond memories by me. God bless and keep him. I am so very sorry to hear of the loss of your Dad. I never got to meet your Dad, nor you Mom, but wish I had. I feel like I know them, through Sheila and Genealogy. My loving thoughts and prayers are with you,during this sad time. As a student of Tri-Rivers, JVS Machine Trades Program during the late 1970's, Clayton hired myself and another student to work as machinist at AST Machine in the afternoons and evenings. I fondly remember Clayton's tutelage on machining and machine designs. In addition, I remember Clayton's love of mid 1970's Cadillac convertibles in which he possessed six or seven low mileage models. Equal to his love of Cadillac convertibles was his collection of high-end, collectible firearms, he often proudly brought new acquisitions into the shop for all to admire. Finally, and most importantly, I remember Clayton's jovial smile, his laugh and his love of life. Shiela,Sandra,and Leroy so sorry to hear of your loss. When both parents are gone,you will see the world in a very different way. Sheila stand tall! stand strong! God is with you always. Your a good person so glad we are cousins and friends..
Rest in Peace, Ole Friend!You will be remembered always! You were the best dad ever! I loved you so much! I learned so much from you! I will miss you so very much! We had so much fun together just hanging out together! Thanks for being a very sweet dad to love! Shelia, my condolence and Prayers to you and your family over the loss of your beloved Father....✝️..